With their delicate meringue-based shells and variety of decadent fillings, macarons are the perfect treat to share with family and friends. Now you can take them to the next level with creative baker, Tan Phay Shing. Her first book, Creative Baking: Macarons, took the baking world by storm with a collection of macarons in the shape of animals, vehicles and things around the house. In this book, she shares all the basic techniques she uses to make her adorable macarons. 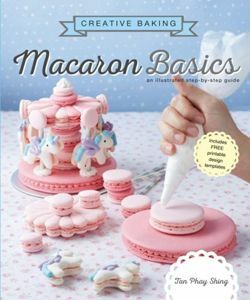 With printable templates, video links and illustrated step-by-step instructions on how to whip up the perfect batter, pipe various shapes and designs, and even assemble macaron structures, this book will enable bakers of any skill level to create macarons of their dreams!